It's a common misconception that low-fat treats aren't tasty, but we at Pawstruck have set out to disprove that theory. 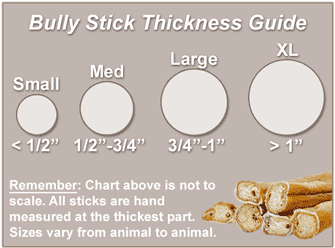 Made of 100% all-natural beef muscle, our 9" Straight Bully Sticks are proof that low-fat treats really can be delicious! Want proof? Just give one to your pup--he won't be able to resist that savory beef flavor. Available in a large thickness to stand up to hours on end of chewing, these are truly the best bully sticks you'll ever find on the Internet (or anywhere, really)! 9" x 0.875" x 0.875"